Service to our school community, the local towns and the greater world is a major component of every White Mountain School education. This aspect of life at WMS is rooted in our Episcopal heritage, and it's in the fabric of everyday life. We believe in giving back, and that is why 100% of our students and faculty participate in some form of service on a regular basis. On campus we have shared responsibilities in the kitchen and dormitories, but students also volunteer their time to cook and serve meals at a local soup kitchen, tutor elementary school children after school, join international service-oriented Field Courses, and gain training as adaptive sports coaches, to name a few. There are many opportunities to participate and make a meaningful contribution at WMS. Each spring we also take a day to make greater contributions to local organizations as a whole school community. Community Service Day sends organized groups of faculty and students to many different local groups to assist with everything from outdoor spring clean-up work, to planting and harvesting vegetables, to playing with children at a day care center. It is a day that we all look forward to, a day we all feel good about. Each year, White Mountain School students and faculty take a full day off from the usual routine to give back. This spring, 15 local non-profit organizations or recreation areas were able to take advantage of crews of WMS community members, who did everything from clearing litter from scenic rivers nearby to playing with children or planting vegetables. 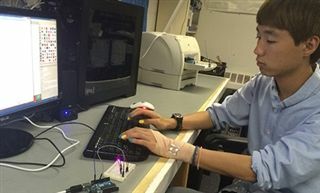 LASR Project: Ben Ford '15 "An Arduino-Controlled SproutBox"
Senior Ben Ford is no stranger to tinkering with robots. In fact, Ben played a major role in the founding and success of the WMS VEX Robotics Team last year— a team that beat the reigning world champions in their very first season together.